In order to start our vacation, Gene and I first had to get to South Korea. My parents drove me and Gene to the airport at midnight, Saturday morning. Since our plane left at 6:30 am Saturday, we figured there was no point in waking up at 3 in the morning so we just didn’t go to sleep that night. That was the longest I’ve stayed up in a long time. It might possibly be the longest I’ve ever stayed up, actually. I don’t think I’d willingly do that again except for travel. The trip over to Korea was kind of a blur for me because of how tired I was. There were moments that, although I was technically awake, I was genuinely out of it. The state of mind I was in helped the trip to generally go by quickly though, so that was a plus. And in the end I think it helped me with jet lag. I only had an issue on the first full day there, otherwise everything was normal (yay). View in Seoul. There were cool fixtures by the sidewalk in this part. First we flew from Denver to Detroit. 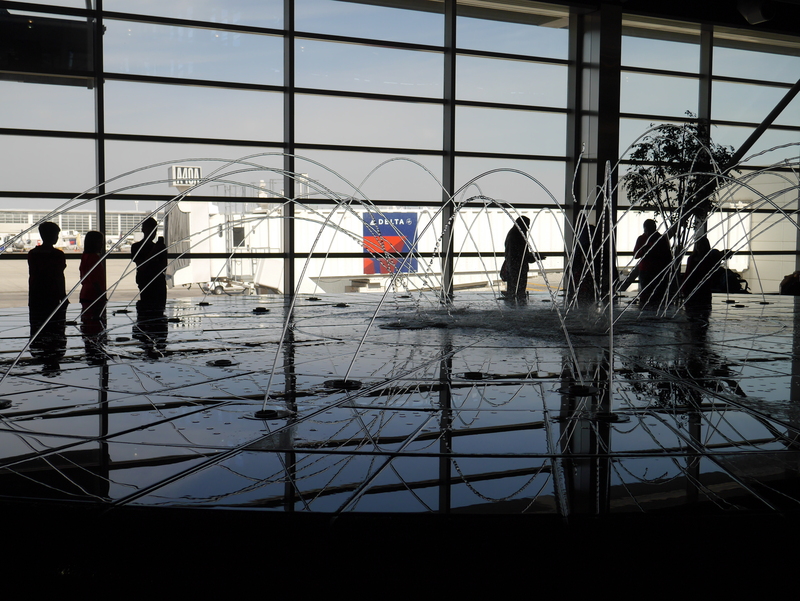 Our gate was right next to the cool water feature (per Detroit Airport) so I gladly stopped and took some pictures. The fountain was interesting but not enough for me to stay there for the full five hour layover. I had no idea that Detroit was a stopping point for international travel. Guess it’s good they have something going for them. Leaving Detroit, we took a 12 hour flight to South Korea. That was the longest flight I’ve ever been on and goodness was it long. I looked at my watch after six hours and couldn’t believe we were only half way there. I feel like it would have been a shorter time going straight from Denver, but hey, what do I know? Thankfully there were lots of good movie options and the food was decent. I ended up watching Saving Mr. Banks, a movie I had wanted to see for a while. I enjoyed it, even though the story was a bit depressing. I was able to sleep a bit, but only in 20 or 30 minute increments. We arrived safely in South Korea and Sidney and Dan picked us up at the airport. It was so nice to see them! I seriously don’t even remember the last time I saw Sidney. Man, it has been way too long. Dan had bought a car that morning so they drove us to Sidney’s apartment. Her place is so cute! She has a studio apartment and I think it’s great. I especially like her plants and her legos. We just visited that evening and I gladly (and quickly) went to sleep. Monday we had a leisurely day where we visited a temple, went to a Steampunk exhibit, and did a bit of shopping. In the morning we went to a Buddhist temple near Sidney’s apartment. Gene really liked it, I think a Buddhist monk lifestyle might be right up his alley. Buddha’s birthday is in a couple of weeks so throughout Seoul there were strings of Buddha lanterns hanging on lamp posts. The temple also had lanterns, loads of them. They made the temple an even lovelier place. 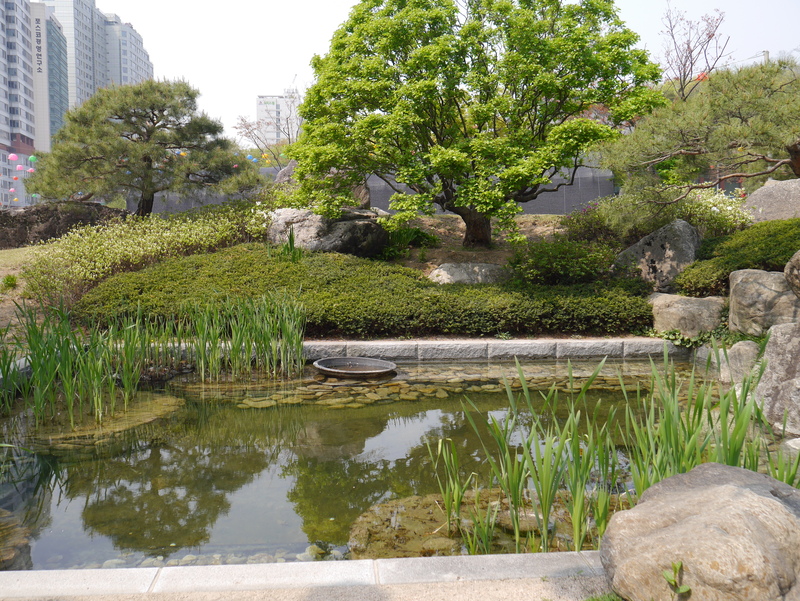 It was pretty peaceful when we went, which was impressive since the temple is surrounded by modern city. 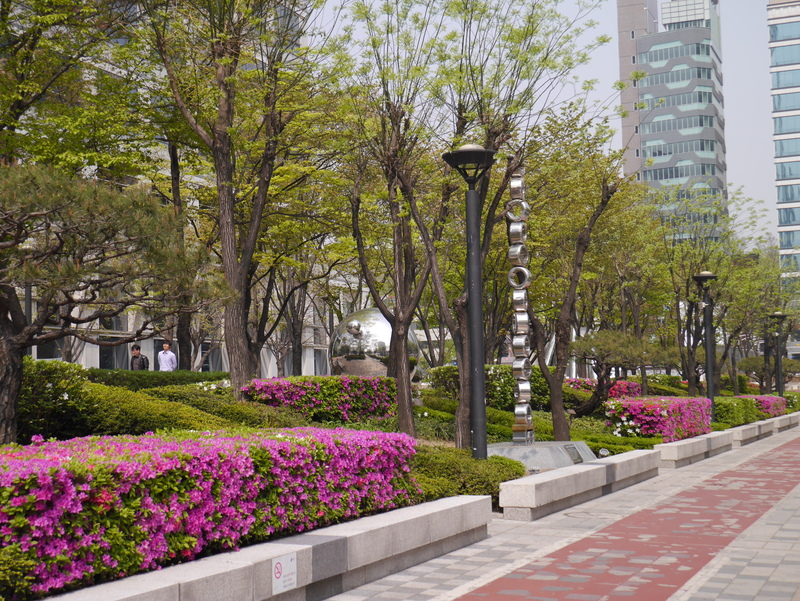 Most of the flowers were in bloom when we came, so there was color everywhere, which made the place even nicer. After visiting the temple we had the Korean version of Chinese food. I’m thinking it’s a bit more authentic than what we have in the U.S. We tried some spicy seafood noodle soup, sweat and sour pork, and fried dumplings. Amazingly, the soup tasted nothing like seafood, which was awesome. Because it was so spicy, I only ate the noodles and vegetables and didn’t even bother tasting the broth. The pork was really sweet and there was a bit too much sauce but it was cool to try. I think Gene made an accurate statement when he said the pork tasted like apple pie, the sauce was that sweet. The dumplings, as always, were delicious. It was cool to try a different country’s version of food and compare it to how we make it in the U.S.
A steampunk time machine. Can I have one? A bit later after lunch we went to a Steampunk exhibit in the main museum in Seoul. 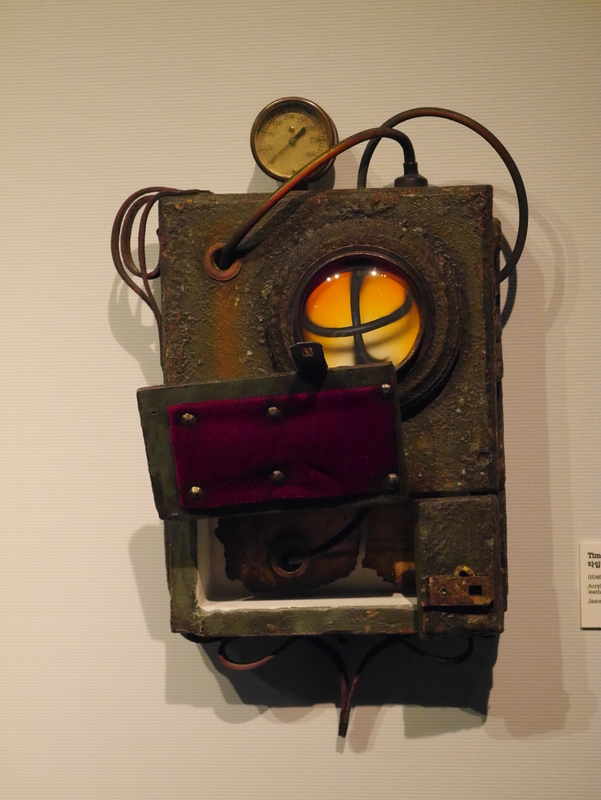 I thought it was so cool that South Korea has an exhibit dedicated to Steampunk. 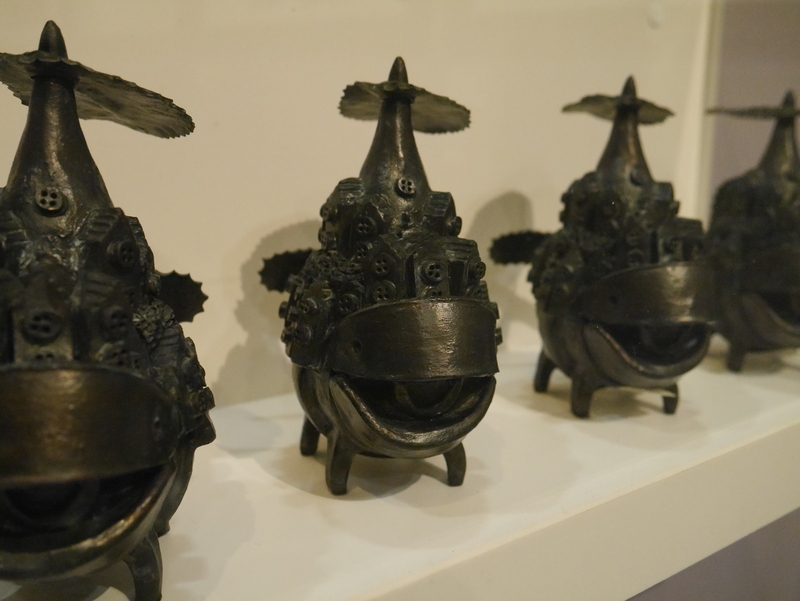 I told Sidney my thoughts and she said that since South Korea is such a small country, even though Steampunk may not be a huge thing, there are enough people in a small enough area that they’ll have an exhibit for it. Hey, I’m cool with that! I don’t think I’ve ever seen that anywhere else. We saw some really awesome pieces in that exhibit. Some fantastic 2D art as well as very interesting 3D pieces. The picture on the left is of a time machine. The colors are great and the idea is fantastic. I’d love to have one for myself! Towards the end of the exhibit we came across an artist that I fell in love with. He had drawings, 3D paper cut-outs, and 3D creatures (see picture above). This guy is impressive and creates pieces in a style that I truly like. I almost got a postcard of his artwork in the gift shop but I couldn’t find the piece that I liked the most. Bummer. However, when we left the exhibit, we were each handed a poster, so I didn’t walk away empty handed! I got a cool toucan poster, which I might take to work once I’m in my office. After the museum I believe we went back to Sidney’s place. This was the point where I got really tired and was kind of zoned out. I ended up taking a nap and instead of us going out to dinner as planned, Sidney and Gene grabbed us some pizza and we ate at home. We had pizza with corn and potato wedges. It was really good! I’ve never had those toppings on pizza before so that was cool to try something new. We tried a lot of new foods while we stayed in Korea. I think we had a fairly good representation of South Korean food while we were there. See my Google + photo album here. Love hearing about your experiences and seeing your pictures. Very cool!